Wild, crazy and funny as hell, Asylum Street Spankers got their start 17 years ago busking on the street that leads to the nuthouse outside of Austin. After taking their madcap, mostly acoustic madness around the country and even to Broadway, the band is embarking on the "Farewell Tour." That's right: A.S.S. are calling it quits. What's the story? "There's not too much of a story," says Christina Marrs, who, following the departure of co-founder Wammo, is the last original Spanker standing. "Financially it's just been really really tough the last few years in this economy. It's rough out there. Every year touring gets more expensive -- gas is more expensive, hotels are more expensive -- and we have a big band. Our income is not keeping pace with our overhead. Trying to wait out the economy is putting us in debt." Add in the decline in revenue from CD sales and you have a sad but all-too-familiar scenario. "The CD thing is big. It's just an industry-wide shift in the way people listen to music," said Marrs. "Our demographic is a bit older, people who tend to buy CDs, but we've noticed a huge loss in sales. A lot of bands are struggling with that. People don't realize how much of your bread and butter retail sales are. When you're looking at $100,000 a year less profit that you're accustomed to, that's a lot not to have anymore." She says show attendance has been steady -- the Spankers have a loyal fan base -- but that doesn't make up for losses and higher costs. "For years and years this was a profitable enterprise, but we're a small business and we just don't have the safety net that would let us ride out the economic slump." Her back-up plan? She doesn't really have one aside from staying closer to home. "This has left me pretty unqualified to do anything else," she said. "I have no skills and no job history or references." She does, however, play a mean saw. On Monday she was taking care of last-minute details before heading west for Tucson where her seven-piece combo starts the 19-date "Spanks for the Memories Farewell Tour." Personnel will include Marrs on vocals, guitars, banjo, ukulele, percussion and musical saw, guitarist/vocalist Nevada Newman (the group's longest-serving non-founder), multi-instrumentalist/vocalist Charlie King, returning for his second stint as a Spanker, and "a youthful brigade of 20-something Spankers." 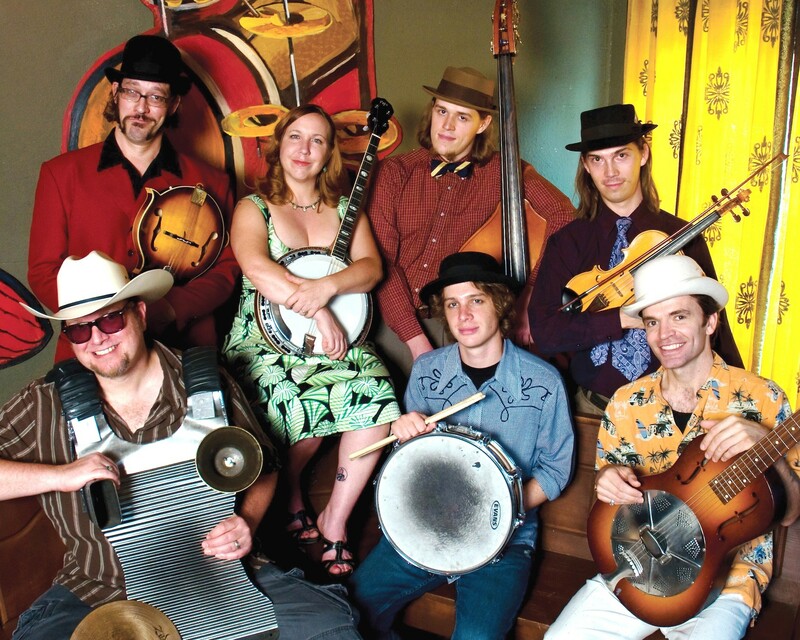 The band spanks Humboldt Brews next Wednesday, Jan. 26, then says goodbye to Arcata. "Bartender, I really did it this time, broke my parole to have a good time... ." Thus begins "Sittin' in a Bar," aka "The Bartender Song," a hit for the Georgia-based country/hip hop band Rehab. Danny "Boone" Alexander and friends he met in rehab included "Sittin' in a Bar" on their Universal debut in 2000, but with no label support the record languished and the band broke up. The song had a life of its own, however. With its trailer trash story sung country-style, but with a hip hop beat and a rap verse, it caught on in juke boxes across the south and elsewhere and went viral, with downloads and YouTube hits in the millions. That spurred a Rehab reformation, and a new radio-friendly version of "The Bartender Song" was recorded with Hank Williams Jr. dropping a verse and, as Rehab's Demun Jones explained, "without all the f-bombs and cuss words, so it could be as far-reaching as possible." Their clueless label tried marketing them as Hot Adult Contemporary. "The need for all those categories is fading away," said Jones. "If somebody likes a good song, they just like it. The record execs are just looking at the spreadsheet. Radio and record labels are becoming more and more unimportant, with the growth of the Internet and merchandise sales, the need for them is shrinking. We make our money on the road." With that in mind the band is escaping from their major label deal, switching to Average Joes Entertainment, a Nashville indie. And they're on the road: The Rehab "Lack of Luxury" Tour with Moonshine Bandits and Brian "BD" Desind hits the Red Fox Tavern next Tuesday. Dobro player Abbie Gardner, banjo picker Laurie MacAllister and guitarist Molly Venter are Red Molly, and no, the band is not named for Venter. The Austin-based singer/songwriter Venter is a newcomer, an ex-solo artist who once opened for the folk trio. (Up until last summer Carolann Solebello was the third Molly.) The band is named for the girl in Richard Thompson's "1952 Vincent Black Lightning," a song about a redhead, a "dangerous man" and a vintage motorcycle. The ladies play their music on Thursday (Jan. 20) at the Arcata Playhouse. To form The Trouble, local folky Chris Parreira joined forces with friends, specifically, Marc Jeffares (formerly of Blue Yonder and Bridgeville) ex-Tao Jonesers bassist Jeff Krider and drummer Ben Forth. "We're playing 90 percent original material, and our covers range from Tom Waits to Marvin Gaye," says Chris, adding, "So far we're calling it soul/rock/alt-country." Thursday the band offers their track-by-track take on Bob Dylan's Blood on the Tracks in a show at Mad River Brewing Co.
Also on Thursday, at the Jambalaya, honky-tonk swing by Wayne "The Train" Hancock who most recently has been recording for alt. country label Bloodshot. As noted by the label, he actually goes beyond national and international fame: "Wayne is the only Bloodshot artist to have had their CD taken aboard a space shuttle flight." Yet another Thursday option: Dallas-based rock 'n' rollers Jonathan Tyler and the Northern Lights play the Red Fox with local instrumental rock band Spilling Nova opening. The 6th annual Humboldt Council of the Blind Benefit at the Alibi Saturday night features a revival of The Great Salvation (on shore leave from the Merchant Marines), plus Eureka's infamous Bad Actors (formerly known as Best Actors and, before that, Arrogant Hare). "Both bands play contemporary indie rock/pop," says a press release from HCB President James Forbes, who just happens to be a Bad Actor. James also notes that the HCB benefit comp, Making Blindness Fashionable, with 22 racks by 90 percent local bands will be available -- proceeds fund "descriptive video and closed captioning for a local movie theater." Ever wonder about the mechanics of jazz improv? The Third Friday Jazz series at the Westhaven Center for the Arts has pianist Darius Brotman discussing just that. "I will be talking at some length about the basic techniques that jazz musicians learn in order to improvise. I hope to help demystify a process that some listeners find an incomprehensible flight of sheer invention but that actually follows definite rules and procedures," says Darius, adding, "I'll be performing a few tunes as well." I was initially confused by the Facebook invite from Candyman to an event Saturday at Empire Squared called "Music To Swing To Vol. II," since Candyman is more metalhead than swing fan. Then I read more, "I know to some of you the idea of [human] suspension is rather odd at best, but the energy that you feel from the person is pretty amazing, so come live a little and see something new!" Oh, that kind of swinging. Vigilante Death Squad, Nukeleosis, Zero Progress and Kill Bandits provide the soundtrack. The weekly Deep Groove Society Sundaze at the Jambalaya features very special guest: Doc Martin, a legend in house music circles known for mixing funk, disco, tribal, etc. and for filling dancefloors worldwide since starting out in the mid-'80s on the SF warehouse scene. Also on the bill, Walter Lee and DGS residents Sunday Jsun and The Middle Agent with a 2 x 4 set (two DJs, four turntables).